One of the first jobs of the day has to be to drop you a line and thank you, Anthony, Glen and the team for a fantastic evening last night. We were looked after superbly and everyone was very impressed with the professional service and attention we received. 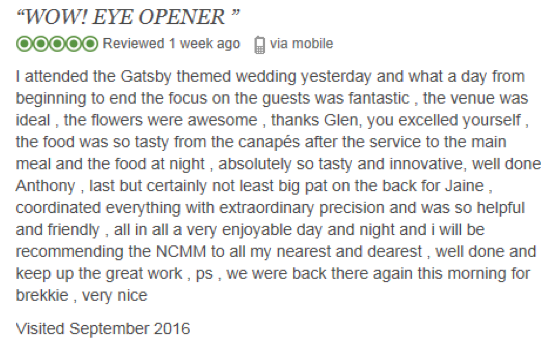 The food was fantastic – again, great comments from everyone on the flavour and quality. So, compliments all round to everyone for their hard work in making our evening so special. I look forward to hopefully working with you and the team again very soon. To Jaine and all the team at the National Coal Mining Museum. Just to express our thanks to everyone who contributed in making our day out at the Mining Museum last friday, so enjoyable. We all had a fantastic time day learning about our heritage and we will remember it for a very long time to come. The food and the serbice we recieved were superb too and thank you to everyone involved. I know many of our staff are keen to visit again with their young families, so that they can experience what a great day out the mining museum is! Just wanted to say again a massive thank you, to you especially, and to the rest of the NCM team, for your outstanding customer service, not only yesterday, but right from when we started planning our event. We’ve had such positive comments about your venue and the event organisation. And the buffet was considered to be one of the best guests had ever had both in quality and quantity and high level of service. Please pass this on to your chef and catering team. Also v important – I can’t find an invoice for the outstanding amount…? Can you forward this to me please so we can make sure it’s sorted. It’s been great working with you. It was so lovely to meet you on Saturday and can I say you and your team did everyone proud. From beginning to the end everything was absolutely outstanding the venue, the flowers and the food was excellent. Your precision coordinating for the whole day being so very friendly and helpful to all. A very big shout out to you, Anthony, Glen and all the team for everything running so smoothly for Denise & Barry Wedding Day. Thank you so much for all your hard work before, during and after after the Wedding. You are all amazing ladies! Our guests commented on how efficient you were. Everything was just perfect. You have all been incredibly helpful and nothing was too much effort. Last minute hiccoughs were immediately solved by your knowledge and quick thinking and really took the stress out of the organisation. Everyone said the venue was incredible, the food went down really well and everyone was so friendly and attentive and went above and beyond for us. Sheridan McKiniry has asked me to contact you as we have now been able to collate the evaluation forms from the event held on Friday 6 May. We wanted to let you know that we received very positive feedback about the venue and as you know we are going to be using it again on 28 July. Sheriden mentioned that your team were really accommodating on the day. Just to mention that we received a few comments about the temperature of the larger room being cold (think it was the air conditioning). We look forward to seeing you again in July. I used the National Coal Mining Museum for a training event in May and would highly recommend it as a venue. Jaine supported me throughout the booking process and communicated with me on a regular basis ensuring all my requirements were met. Even changing numbers and equipment requirements a few days before the event was never treated as an issue which made you feel valued as a customer. On arrival we had a lovely warm welcome and the room was set up to our exact requirements. Janie took time to make sure I was aware of all the facilities available to me including a tour down the mine if it was something we would wish to do. During the day ‘Danny’ was the support from the team to our room and his customer service skills were exemplary, so polite and attentive making sure we had everything we required throughout the day. What an asset he is to your business. Coffee was served with delicious shortbread biscuits and the lunches were great with more than enough food for the group. Nothing was too much trouble for the catering team who were happy to prepare bacon rolls last minute for us. The room was large and bright and has all the equipment you need to run a successful training event and has the added bonus of air-conditioning. The National Coal Mining Museum is a is fantastic venue but it’s the team who make it special and I cannot recommend them highly enough. On behalf of the Charity I want thank you and your team for hosting an excellent day for us at the Coal Mine Museum last week. You and your team went out of your way to accommodate us and cater for some specific last minute dietary requirements, plus support us with some weird and wonderful ideas such as tablecloths to write on! We have had great feedback from the 100+ delegates that attended and in particular the delicious food.